You don't need a green thumb to love plants galore! 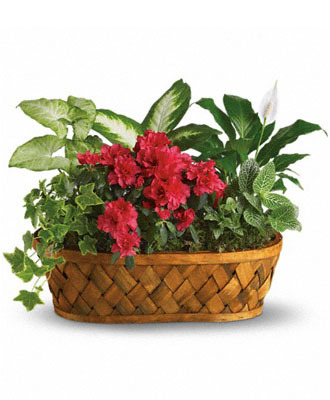 Plants, plants and more plants are delivered in a handsome woodchip basket. Easier to care for than pronounce, a hot pink azalea and white hypoestes are joined by dieffenbachia, nephthytis, spathiphyllum and ivy. All are hand-arranged in a pretty wicker basket. It's an abundance of natural beauty. Variety of plants and container style may vary.